Description: Very slender, erect, tufted annual to 0.4 m high; culms smooth or finely scaberulous, 2-noded. Leaves with sheath appressed to the culms; ligule obtuse, laciniate, 2–3 mm long; blade very narrow, almost filiform, inrolled, crowded at the base, 0.3–2 mm wide. Panicle occupying half or more of the culm, ± spreading. 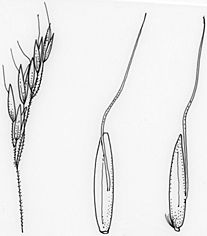 Spikelets laterally compressed, c. 2–4 mm long, often purplish. Glumes rather narrowly gaping, acute, keeled, the lower glume longer. Lemma truncate or obscurely 4-toothed at the apex, 1.5–2.3 mm long; awn rather fine, exserted. Palea minute. Distribution and occurrence: Grows in high alpine herbfields and sod tussock grassland, more common at lower elevations. Other Australian states: Vic. Tas. Tas.